This fall, the Academy will host the 18th International Conference on Grey Literature to reveal one of the most valuable hidden resources for students, health professionals, and researchers. This post was originally posted on The New York Academy of Medicine‘s blog, Urban Health Matters. Where can anyone get access to more than 20,000 expert health and science resources for free? The Grey Literature Report—GreyLit for short. 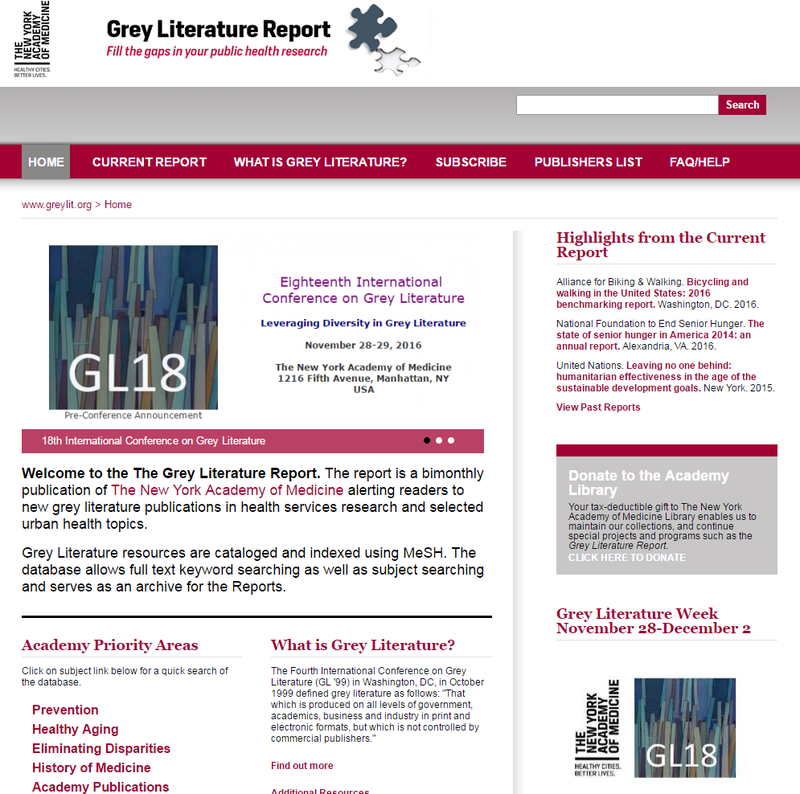 A treasured resource among librarians since 1999, the GreyLit Report also offers students, health sciences researchers and professionals a one-stop-shop for incredibly difficult to find information. Once a quarterly publication, the GreyLit Report became so popular by 2006 that the Academy doubled the number of issues published each year. The very title of the report is a clue to why it’s such a valuable tool. The carefully curated resources it provides often exist in a “grey” area between widely distributed peer-reviewed journals and the proprietary research that does not make it into the public sphere. Grey literature is notoriously hard to find, often buried on the websites of any number of organizations or in the stacks of medical and science libraries. By publishing a categorized, bi-monthly compendium of the top resources in the field, the GreyLit Report does the detective work for thousands of overwhelmed students, scientists and academics that often leads them to the critical information they need to complete their work. One popular document included in the report, for example, was A closer look at the implementation of taxation on sugar-sweetened beverages: a civil society perspective, published by the government of Barbados. Normally, this study would not land on the desks of American researchers, even those studying nutrition policy. It was nearly impossible to find on Google, prior to its mention in the August 2016 GreyLit newsletter, yet it offers a valuable analysis of the policy implications of attempting to regulate the consumption of unhealthy foods. I discovered GreyLit long before I came to the Academy to become the editor of the report. In my previous life at AARP, as editor of the AgeLine Database, the premier literature database on aging research, the GreyLit Report became one of my most valuable sources of publications on aging. I could just glance at the report and find new resources. It also became a way for AARP’s research to be disseminated to a broader audience, as it sometimes included research from other divisions. Now, 17 years after it was created, the Academy’s GreyLit Report is still the only publication of its type in the United States. This year, as members of GreyNet International, an organization dedicated to increasing public awareness of grey literature, the Academy will be hosting the 18th International Conference on Grey Literature on Nov 28th and 29th, 2016. This year’s topic is Leveraging Diversity because grey literature can play a pivotal role in the search for solutions to urban health challenges here in New York and around the world. That’s also why we have named the week of Nov 28 as the 1st International Grey Literature Week. We will be holding workshops and events along with the conference in celebration of grey literature. If you are interested in finding the best, hidden resources in your field, join us this November and discover GreyLit! This entry was posted in Announcements, Collections, Digital publishing, Events and tagged grey literature, grey literature week by nyamhistofmed. Bookmark the permalink.